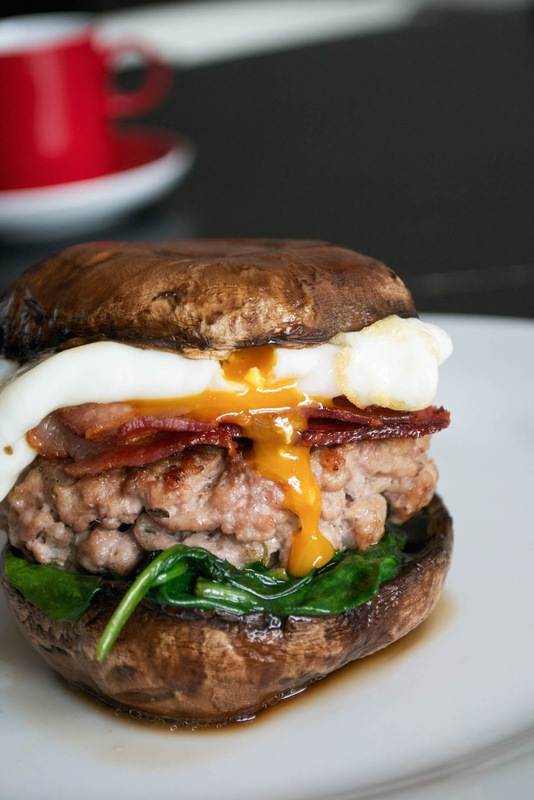 A beautiful paleo breakfast burger, with juicy pork, crispy bacon and a runny yolked egg. Perfect breakfast food! I received a financial contribution towards the ingredients and the cost of creating this post. You all know how I feel about #mushroomsasthebun, don't you? I love it. And mushrooms have much more flavour, texture and are much juicier than any bread roll I've ever had. I was contacted by the Just Add Mushrooms campaign, who asked me to come up with a fab mushroom recipe that you would all love. Well, I think I cracked it. This breakfast burger (although feel free to eat it any other time of the day, too, obviously) is made up from two Portabello mushrooms, a home-made sage pork sausage burger, wilted spinach, streaky smoked bacon and a runny fried egg. Gorgeous, don't you think? I've included some step-by-step pics so you can see how the whole thing is made. Easy peasy and flippin' gorgeous. 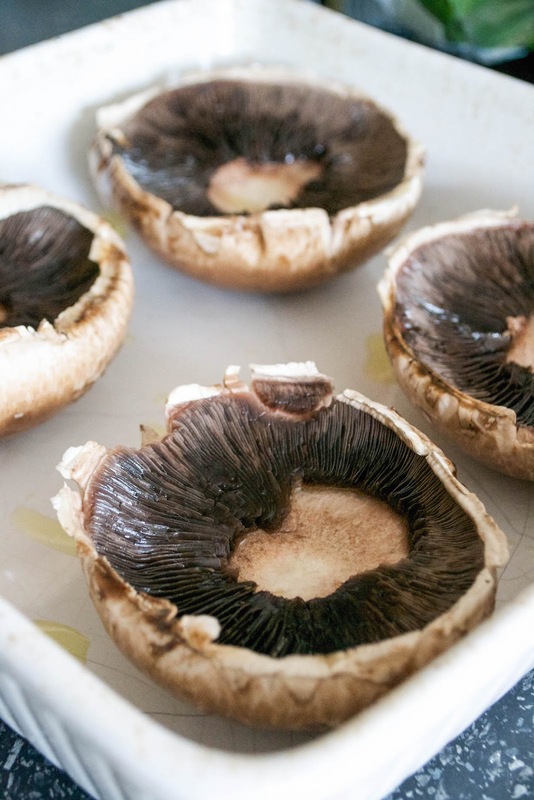 First, arrange your cleaned Portabello mushrooms in a baking or roasting dish and drizzle over about a teaspoon of your cooking oil. If your cooking oil is solid, rub it between your fingers first and add it on with your hands. Sprinkle over a pinch of salt and slide into the oven preheated at gas mark 7/210ºC for 10 minutes. Meanwhile, mix the pork mince, the sage and garlic salt in a bowl and form into four burgers. You'll need two of them for this recipe, so save the other two for leftovers during the week). Fry them in a frying pan or griddle for about 5-7 minutes, or until golden and sealed on the outside. Using tongs, transfer them to another roasting dish and slide into the oven to finished cooking. The mushrooms should now be softened, dark and sizzling. Remove them from the oven and leave to rest for a minute. 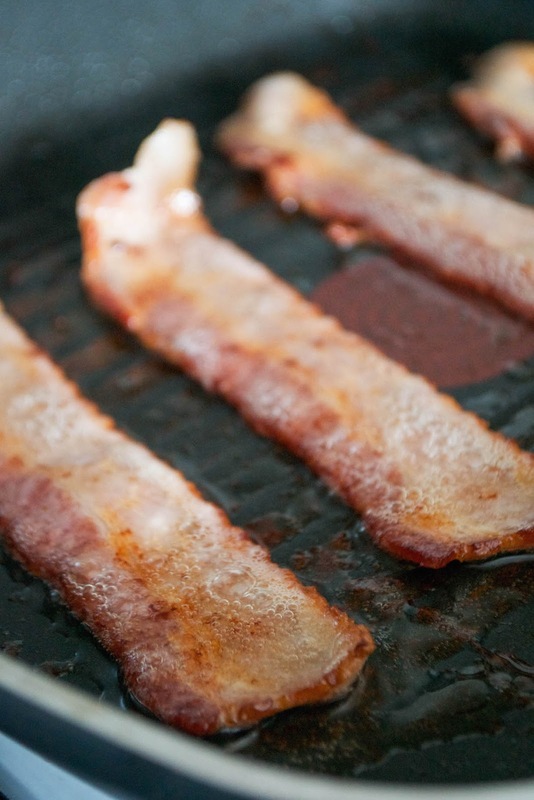 Using the pan you fried the pork burgers in, cook the bacon until crisp and put to one side. You will now have a griddle or frying pan with all those bacony, pork sausage flavours. Don't waste it - dump the washed spinach into the pan but turn off the heat. 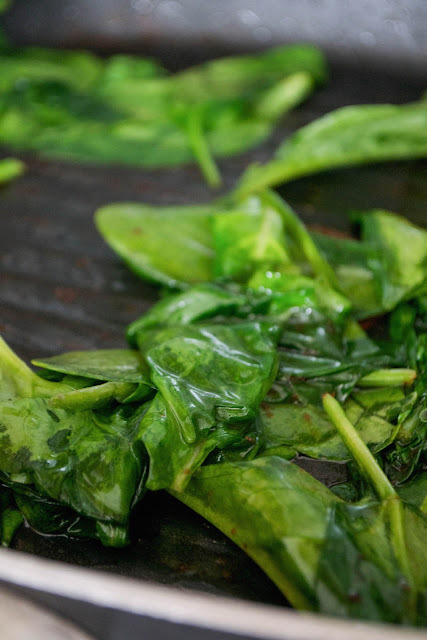 The spinach leaves will wilt gently in the residual heat in the pan. Start to assemble the burger. First, place one of the mushrooms, bottom-side up, on a plate (tip off any excess juices that have collected first). Then add your spinach. 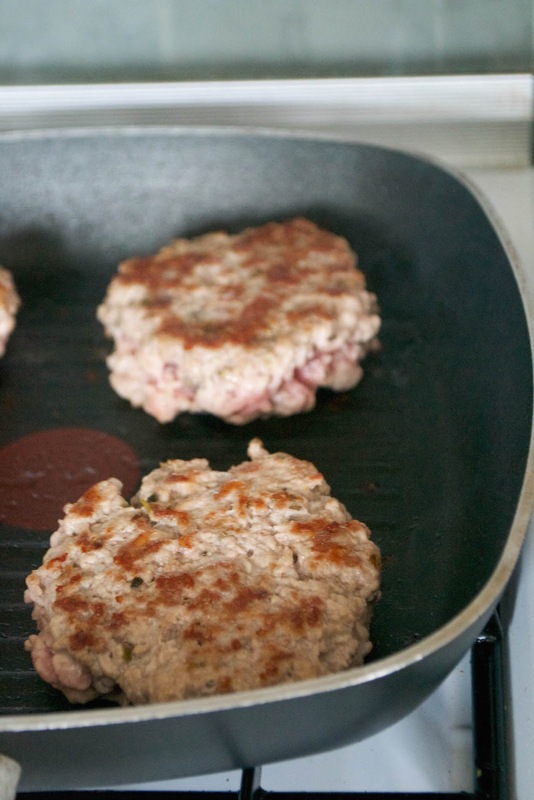 The pork burgers should now be thoroughly cooked - check before serving, and then place one of the burgers on top. 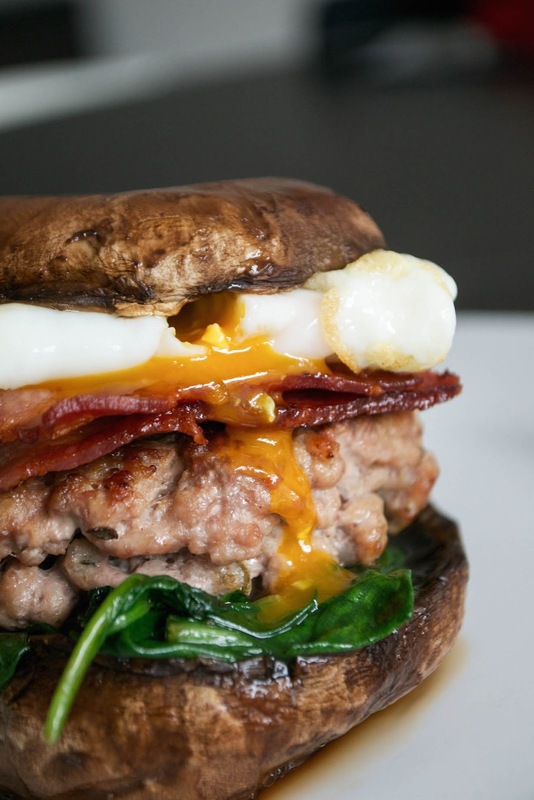 Fold over the crisp, golden bacon rashers and place these on top of the burger. 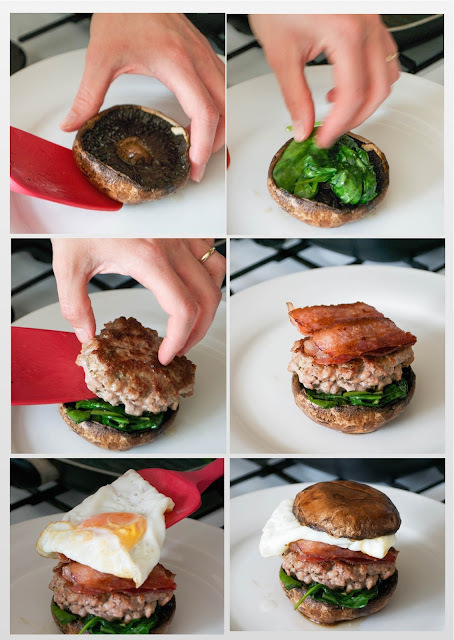 Next, quickly fry the eggs to your liking and place one on top, finishing with the other mushroom. By the way, if you love mushrooms and would like to grow your own, A Literary Cocktail has a post about growing your own mushrooms, in a special kit - go have a look if you're curious!